Was there a female apostolic succession? The canonical gospels of the New Testament record the presence of a number of women disciples around Jesus, especially Mary Magdalene. Could there have been a female apostolic succession which ostensibly has gone unrecorded in the official history books? In the Christian Gnostic texts Mary Magdalene is referred to as “the apostle to the apostles” and in France (ancient Celtic Gaul) she is known as the “apostle of Provence”. There is also a tradition of another female disciple of Jesus called Lourda who founded Lourdes in France. Looking at the possible role of female Christian initiates within the Church of Christ, in some instances they may have been ordained under the title of Deaconess. Moreover, the Celtic female saints were often associated with holy wells and springs which could suggest a continuity with the pre-Christian Annat tradition relating to the mother Goddess Anaitis who may have been associated with lunar worship. In the ancient Pagan era the moon held priority to the sun in celtic devotion. In fact, the celtic calendar is lunar based. Interestingly, the gaelic celts saw the moon as masculine and the sun as feminine. St. Etheldreda, a 7th century British saint, daughter of a British King. Married a King of Northumbria. Later became an Abbess founding a monastery at Ely in East Anglia on the site of the present cathedral. 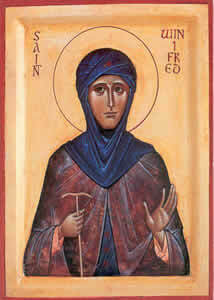 St. Winifred (Gwenfrewi in welsh meaning radiant freda). Gwen can mean white, shining or holy. She was a niece of St. Beuno (6th century) who claimed descent from a relative of the Holy Family of Jesus. She was renowned for her healing well at Holywell in North Wales. On the seal of the cathedral chapter of St. Asaph, in Wales, she appears as an Abbess bearing a crozier which was a symbol of leadership and authority. 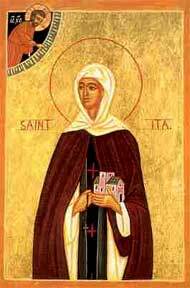 St. Ita (Ytha). Born in 480 A. D of noble descent in County Waterford, Ireland. She founded a monastic settlement at Killeedy (Cill Ide). She is said to have died in 570 A.D. and was known as “the foster mother of the saints of Ireland”, because she was a mother figure to several of Ireland’s early saints, including St. Brendan. Her symbol was a cross with a heart at the centre of a small labyrinth. St. Hilda (614-680 A. D). She was the niece of King Edwin of Northumbria. She studied the traditions of Celtic monasticism which St. Aiden brought from Iona. St. Aiden later appointed St. Hilda as an Abbess and she founded a monastery at Whitby in north Yorkshire. Archeological evidence shows that her monastery was in the celtic style with its members living in small houses for two or three people. She gained such a reputation for wisdom that kings and princes sought her advice. St. Bega. A 7th century saint who came from County Down in Ireland to north Britain and apparently founded a small female religious community inspired by St. Aiden. Placenames link St. Bega with Cumbria, northern England, and the Scottish borders. She also associated with St. Hilda and St. Etheldreda. St. Brigid or Brigit (453-523 A. D) who founded a monastery for both monks and nuns at Kildare in Ireland. 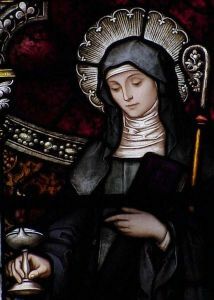 She is said to be buried at Downpatrick together with St. Patrick and St. Columba, which clearly shows that St. Brigid was highly venerated in the early Celtic Church. It has been suggested that Kildare may have been the site of an earlier Druid seat of learning. Like their male counterparts, all of these female saints were of royal and noble descent. Could they have been initiates of a Johannine Celtic Church? It may be of interest to note that traditionally St. John, together with Mary, the mother of Jesus, and Mary Magdalene, was at Ephesus in Anatolia, Asia Minor, where there was a major mystery temple dedicated to Artemis, a moon goddess, whom the Greeks also called Diana. This Temple was one of the seven wonders of the ancient world. The Johannine mystery tradition may have incorporated an initiatic tradition which could have included women as well as men. In the 2nd and 3rd centuries women continued to be involved in the apostolate. The Didascalia Apostolorum (c. 250 A. D), a pastoral handbook, urges Bishops to ordain men and women deacons. The Council of Nicea (325 A. D) witnessed to the existence of women deacons. The Greek Fathers of the 3rd, 4th and 5th centuries mention women deacons. The Apostolic Constitutions (380 A. D), another collection of pastoral directives, repeated the instructions on women deacons already found in the Didascalia. It also preserved the oldest known ordination rite for women deacons. A 4th century tombstone in Jerusalem commemorates a deacon called Sophia. The Greek text reads “Here lies the servant and bride of Christ, Sophia, the (woman) deacon.” In Cicilia, in modern Turkey, five tombs honouring the memory of women deacons have been found. In Jerusalem, four women deacons are recorded on tombstones and another four elsewhere in Palestine. The ancient calendar of saints for the Greek-Byzantine part of the church fixed feast days for 26 women deacons. They provide evidence for the impact women deacons had upon their local church communities. In Gaul (ancient France) we find women deacons such as St. Radegunde and St. Genevieve, the patron saint of Paris. Some women deacons were nuns at the same time, often superiors of convents so that they could attend to the spiritual needs of their sisters. This may explain how in the West traces of the diaconate ordination were retained in the installation of prioresses and abbesses of some orders of women. The laws of Justinian more than once mention the men and women under the heading “men and women deacons”. The Didascalia of the apostles (c. 250 A. D) was a pastoral handbook for bishops, presented as instructions left by the apostles. Originally composed in Greek it was translated into Syriac, Arabic and Latin. (Interestingly, in the Latin which is the only version available for this text, the term ‘Diaconissa’ appears.) This apostolic pastoral handbook states: “We assert that the ministry of a woman deacon is especially required and urgent. For our Lord and Saviour was himself served by women deacons, such as Mary Magdalene, Mary, the daughter of James and mother of Joseph, and the mother of the sons of Zebedee, along with still other women.” The original Greek word for deacon meant “servant” and it was used as a term for both men and women. In Christian communities it indicated a special ministry to which persons were assigned by ordination. As an interesting aside, the Rev. William Lee Ker, in his book Mother Lodge Kilwinning: the Ancient Lodge of Scotland, published in 1896, says that: “The Grand Deacons of Mother Kilwinning from 1642 to 1732 were to all intents and purposes the Grand Masters.” We know that Kilwinning was at one time the site of a Culdee Community. Could the use of the term Deacon in this instance imply a possible continuity from the Culdee Christian Order to Scottish Freemasonry? Could there have been a female apostolic succession from Mary, the mother of Jesus, just as there was a male apostolic succession ordained by her son? Could this perhaps have been written out of the ostensible historical records by male scribes acting under the instruction and supervision of a patriarchally dominated church? With the information to hand at present we can but speculate and wonder. We should also remember that a number of celtic royal saints, both male and female, claimed genealogical descent from the family of the Mother of Christ. This might also reinforce the notion of a possible hereditary right of succession. Hereditary succession was central to the Culdee communities and fifteen unbroken generations have been listed at Armagh, the ecclesiastical primacy of the Celtic church in Ireland. It is possible that a female apostolic succession could have been founded on a family and hereditary basis from women who were directly related to the Holy Family of Christ.